Not gonna lie, I love Stats. I love looking at Google Analytic to see who is visiting my blog. I guess it’s kind of vain, but it’s fun! I also like to looking at the search terms that brings people here. Here’s the top 5 queries that are bringing people to this blog. I think this list is kind of interesting because it sort of fall within what my interests are. Before I dig in, I just want to say I love kitsch. I love those road side attractions! It just seems go hand in had with a road trip. We have seen giant shoe houses, a big ball of rubber band (in San Francisco under a blanket. Don’t touch it the guy will yell at you. ), and a whole bunch of other stuff. Anyway, as you can see wyatt earp grave has the most hits. I guess he’s pretty popular. I remember that trip, took us FOREVER to find his grave. I thought I’d share with everyone in case they are looking for it and have hard time locating it. 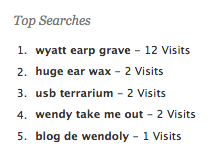 Now, I don’t know why giant ear wax search would show my blog. I don’t think I ever like to see a giant ear wax, but there you are. But I guess it also fall under road side attractions category.